I am very excited to announce the Monmouth Museum's upcoming exhibition, "All Aboard, Railroads and the Historic Landscapes They Travel" which was curated by yours truly! See below for the full press release and look forward to future posts on the artists featured in the exhibition! 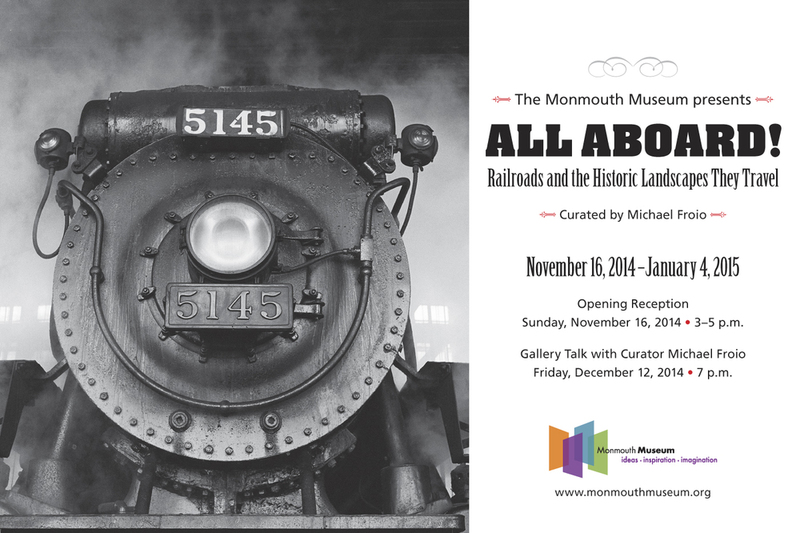 (LINCROFT, NJ) The Monmouth Museum presents All Aboard! Railroads and the Historic Landscapes They Travel, curated by Michael Froio. An Opening Reception will be held on Sunday, November 16, 3 - 5 pm, and a Gallery Talk will take place on Friday, December 12 at 7 pm, with Curator Michael Froio. The Opening Reception and Gallery Talk are free of charge. We are delighted to announce the Monmouth Museum Model Train Display will make its comeback with new, improved trains and updated network of track! The Friends of Monmouth Museum will present their Annual Holiday Tree, decorated with train and railroad memorabilia! Railroads played a vital role in the development of the United States, providing the vehicle to feed the industrial revolution, the means to bridge the east and west coasts and the ability to move the American people, goods and raw materials over a network that greatly shaped the American landscape. All Aboard! is a celebration of railroads in the American landscape detailing some of the most transformative times in railroad history. This visually stunning and informative historical exhibition features the work of eight renowned photographers, including David Plowden, Jim Shaughnessy (both on loan from The Center for Railroad Photography and Art), Ron Wright, Mel Patrick, Scott Lothes, John Sanderson, Travis Dewitz and Guest Curator Michael Froio. Also featured are vintage travel and advertising posters (on loan from the Private Collection of Bennett Levin). All Aboard! Railroads & The Historic Landscapes They Travel is an enchanting journey through the history and nostalgia the railroads evoke and the landscape they have traveled for over 150 years. Michael Froio is an acclaimed professional photographer, associate professor and facilities manager for the Photography Program, part of the Antoinette Westphal College of Media Arts and Design at Drexel University in Philadelphia. Michael has received several grants and fellowships including a two-year Career Development Fellowship and Alumni Travel Grant with the Center for Emerging Visual Artists as well as a 2009 Individual Artist Fellowship from the New Jersey Council on the Arts. Michael has published articles with the National Railway Historical Society and presented lectures for the Center for Railroad Photography and Art, The Library Company of Philadelphia and various Chapters of the National Railway Historical Society across the country.